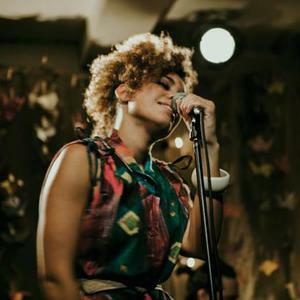 An experimental and self taught singer and songwriter originally hailing from South East London, Andreya Triana grew up submerged in a multicultural atmosphere. A unique vocalist, Andreya begun singing at the tender age of 7 taking influence from the sights and sounds of inner city London. Her early love and passion for music would see her locked in her bedroom for hours on end writing poetry, making home-made mix tapes and recording tracks - utilising two battered cassette decks to record harmonies. Her early love of improvisation would warp and change over the years, hugely influencing her 'Freeflo Sessions' - a hypnotic one woman show using a sampler to loop vocals, percussive sounds and beats live. To date she has taken her Freeflo Sessions worldwide, dazzling audiences far and wide with her cutting edge and soulful performances. 2006 saw her selected from thousands to take part in the Red Bull Music Academy in Australia where she further developed her style for improvisation and secured links with some of the best producers and musicians on the music scene. Multiple collaborations ensued daily at the Academy, 'Tea Leaf Dancers' a collaboration with glitchy hip hop producer Flying Lotus (released on Warp Records) was a product of this and has been her most successful musical venture to date. Hailed as a classic while getting rave reviews from Benji B and Gilles Peterson while getting airplay on Annie Mac's Radio One show. It was this track that also caught the attention of Ninja Tune stalwart Bonobo. 2009 has been an eventful year for Miss Triana, touring America and Canada with the Bonobo live band, playing on the BBC Introducing stage at Glastonbury showcasing new material and signing a three album deal with Ninja Tune Records. 2010 will see the release of her album Lost Where I Belong, produced by jazzy beat master Bonobo. Fellow Ninja Tune Records singer and superstar songwriter Fink also stepped up to co-write two tracks for the album. Lost Where I Belong is a beautifully honest album combining Soul, Folk, Jazz and Bonobo's cinematic magic for a highly anticipated and hotly tipped debut, released on Ninja Tune in August 2010.